I've been buried in final book manuscript revisions, and have been noticing that I'm increasingly using the term "management" rather than "administration" in my analyses of university governance. Part of the reason is that my employer, the University of California, uses Senior Management Group as a formal employment classification. But it's also because the friendlier aspects of the term "administration" seem decreasingly part of everyday academic life. Friendliness was administration as support structure, as collaborator, as partner, as the entity that did not take orders from obnoxious egocentric faculty prima donnas the way that frontline staff often had to do, but that accepted balanced power relations and a certain mutual respect that could make decisions move relatively quickly and equitably. It would avoid command and control of the kind that prevailed in the army and in most corporations, where executive authority consisted of direct rule over subordinates. Of course I idealize the university as a bastion of mutual consent. The AAUP and other organizations on the ground had to struggle to maintain some balance of power between academic and non-academic personnel. Financial control and "decision rights' were formally top down: check the many powers of the UC president as one example. But for decades if not centuries the university stayed relatively close to a kind of collegium, to use Jim Sleeper's preferred term, in which it was the embodiment of educational practices that rested on the accumulated knowledge of its faculty, that were expressed in teaching, research, and public service with students, staff, and the larger public, and that required meaningful self-governance to be effective. For these practices to be really good, to be meaningful, they had to be governed by the knowledgeable ones, the people who were inside and enacting the day-to-day practices. This was not a mystical quasi-religious doctrine but the foundation of professional expertise as it allowed almost any kind of complex skill, white-collar and blue-collar alike. Even if the senior administrators came from the faculty, they were expected to take seriously and not lightly overturn the judgements of active faculty whose human capital was of a newer vintage, to use the term of an education economist like Walter McMahon. The model tried to make unilateral authority very rare. But like many of us, I am now often using the term academic management because that unilateral authority has become so common. It is the rule in the UK university now, and to an extent that would surprise many Americans. It is increasingly common in the US. The most famous recent case was the rescinding of the hire of Steven Salaita at the University of Illinois at Urbana-Champaign. The AAUP has released its report on that case, which sweepingly rejects the manner in which administrative authority was used. It argues that that sort of managerial power is not compatible with academic freedom and established professional practices. 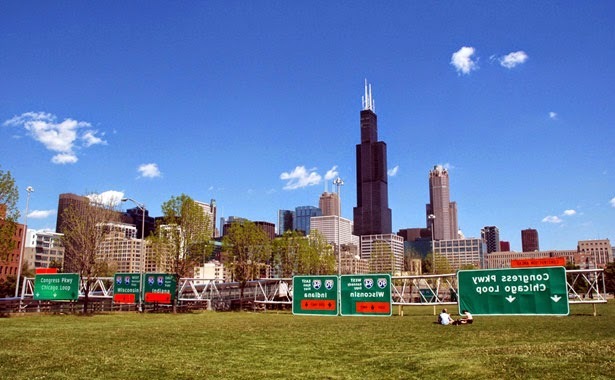 We've just heard about another kind of case at another University of Illinois campus--UI Chicago. Here senior administrators rescinded hires in innovative cluster programs without faculty consultation, and in areas of special interest to that campus's special student population. A number of faculty have detailed their grievances with the process and decision, and we've posted their letter with signatures. It's an interesting local issue with national resonance. The big story in Higher Education this year has been the threat of massive budget cuts. From Wisconsin to Louisiana, from Kansas to Arizona, and from Maine to North Carolina, state governors and legislators have proposed or enacted cuts to public colleges and universities. Although the outcome of this year's budget struggles remain uncertain, it does seem clear that California is not going to impose new cuts. Instead we seem to be battling over the size of small state funding increases. That contrast between California and other states might appear to be grounds for confidence in the future. But that would be premature. Although the state has increased funding over the last several years and is proposing a small increment this year--it is important to recognize not only that these increases do not compensate for the years of cutbacks but that they help to solidify a strategy of permanent austerity budgeting. One way to see this point is to look at the recent Legislative Analyst's report on "enrollment funding" for UC. The main point of the report is to call for the Governor and Legislature to reinstate "enrollment funding" (i.e. to tie state funding to specific enrollment targets for the University). Now I should say that I have no problem with the idea of enrollment funding. Both the Governor and UC have done away with it (the Governor I suspect because he doesn't want to be obligated to increase funding with enrollment and UCOP because it allows them greater flexibility should they want to restrict enrollment without losing state funds). If made correctly, there are good arguments for a greater linkage to tie funding to enrollment and to ensure that funding goes to support that enrollment (for instance ensuring that a new permanent faculty FTE is hired for every 19 additional students as is assumed in the financial calculations). (4) But the way that the LAO seeks to organize enrollment funding is less defensible and also revealing. The logic of enrollment funding ties increase state support to the marginal costs of additional students. The LAO calculates the marginal cost at $9244 for general campus students (UC's is slightly higher but I am going to use the LAO's). (8) The LAO recommends setting the present year as the baseline for enrollment--which would also lock in the per student funding as it now exists as a baseline. They propose that present enrollment be considered the baseline because it would avoid a conflict over whether funding should go for increased enrollment or to answer UC's claim that there are significant numbers of unfunded students. 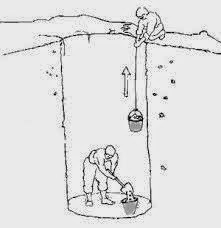 But here is where the problem lies. Instead of providing a way to address the conflict over whether or not the state is fully funding students, the LAO simply eliminates the question by refusing to engage with it. And that has serious implications. The easiest way to do see these implications is to accept the LAO cost logic and then look backwards over the last decade and one half. To be sure this means that all of what follows are estimates--but I think that the general picture is clear. In 2001-2002 UC received $3,279,000,000 from the General Fund. In the fall of 2001 there were 167,914 resident students enrolled on the general campuses. In the fall of 2013 (the last year that I have good numbers for) there were 196,917 resident students enrolled on the general campuses. That increase of 29,742 should have led--given the LAO's calculations of marginal costs to a funding increase of approximately $275M from the state (and this is without additional costs for health system students). Put another way, the 2013-2014 UC General Fund support would have been $3,560,000,000. Instead it was $2,884,456,000. The Governor's proposed General Fund contribution for 2015-2016 is $3,106,138. The numbers, although approximate, are clear. The LAO's proposal on enrollment funding would lock UC into a permanent structure of state austerity. Although the state does pick up some of these losses through Cal Grants they do not recover all--nor do they even begin to backfill the long-standing under-funding of the University. Students, staff, and faculty have been forced to assume the costs of this austerity--whether in terms of higher tuition, larger classes, or increased workloads. By all means have the state engage in enrollment funding. But also have the state fund that enrollment at an adequate level, and allow it to rise as costs and educational needs change. 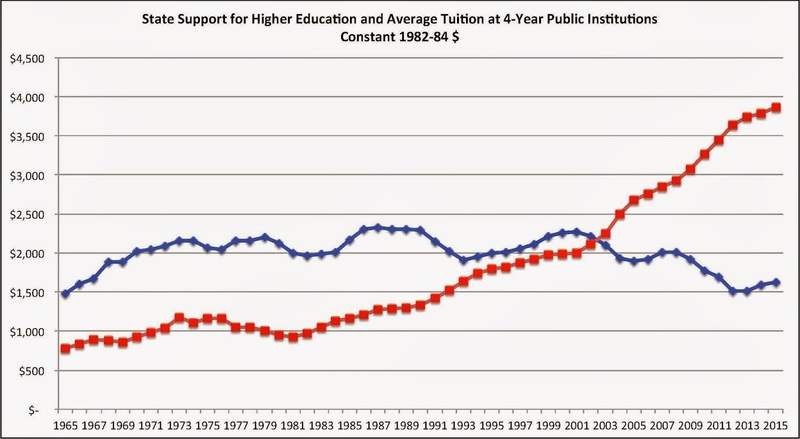 [P]ublic investment in higher education in America is vastly larger today, in inflation-adjusted dollars, than it was during the supposed golden age of public funding in the 1960s. Such spending has increased at a much faster rate than government spending in general. For example, the military’s budget is about 1.8 times higher today than it was in 1960, while legislative appropriations to higher education are more than 10 times higher. In other words, there is no state funding problem, and never has been. The cuts are a "fairy tale." This claim is a conceptual disaster at a time when many state legislatures have convinced themselves of exactly this--that if you add up all the revenues available to public universities, they haven't been cut at all. California's special variant is the claim that UC actually profited from the financial crisis and now has more money than ever. (Then-Assembly Speaker John Pérez laid this out to the UC Board of Regents in January 2013. And now he's UC Regent Pérez.) The fallout has been a slew of competing legislative efforts to bring UC to heel, so many that I need a scorecard like this Sac Bee piece, and Cloudminder's recent links. There he repeated a milder version of the NYT claim, "It’s quite an interpretive challenge to translate these numbers into the claim, made universally by higher ed administrators, that fifty or more years of practically continual tuition rate hikes have been caused by cuts in public subsidies." So first, do Prof. Campos's numbers show crazy public funding growth? 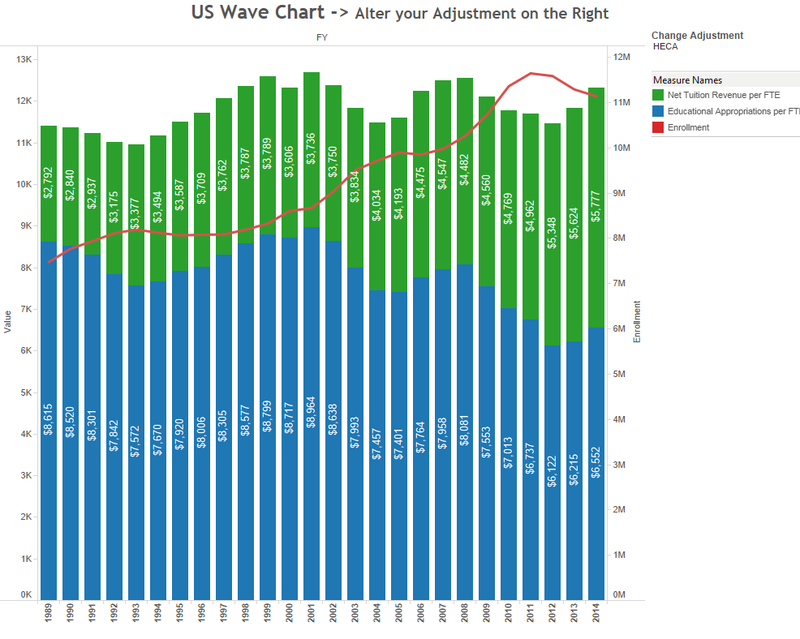 Sticking with state appropriations, the first thing to point out is that the curve falls into two periods: a steady rise from 1960 to 1990, and a slower, jagged rise from 1990 to 2015, with an aggregate decrease from 2010-2015. 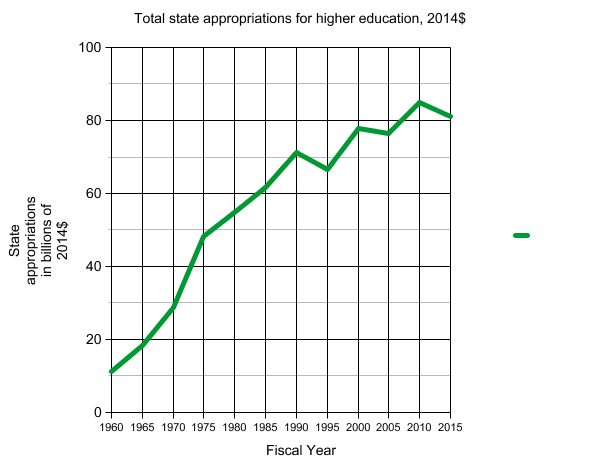 The State Higher Education Executive Officers (SHEEO) just released its report on state appropriations for FY 2014, and confirms that state appropriations in constant dollars are still about 19 percent below their 2008 peak. Nobody has been complaining about state appropriations from 1960 to 1990. The complaints are about overall stagnation after 1990 and real cuts after 2008. By folding recent declines into a bygone golden age, Prof Campos distorts the current history and sidesteps the current funding debate. Even this overall appropriations growth doesn't show the insane extravagance we're supposed to see. The best historical data about states comes from Illinois State's longtime Grapevine project, which began toting up state allocations for the 1960-61 year. They came to about $1.5 billion total (when California appropriated twice the total of the next largest public system, Illinois'). 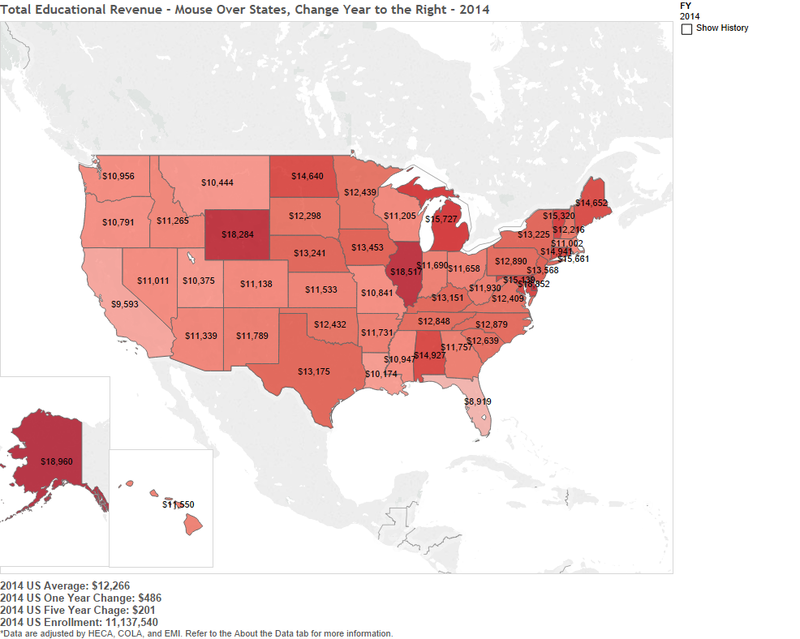 By 2015 the total was about $81 billion, for an unadjusted increase of 54x. Sounds like the states were just throwing money at public colleges, right? Wrong. Money often grows at that rate. Say you're a retirement fund, and you started with $1.5 billion in 1960. 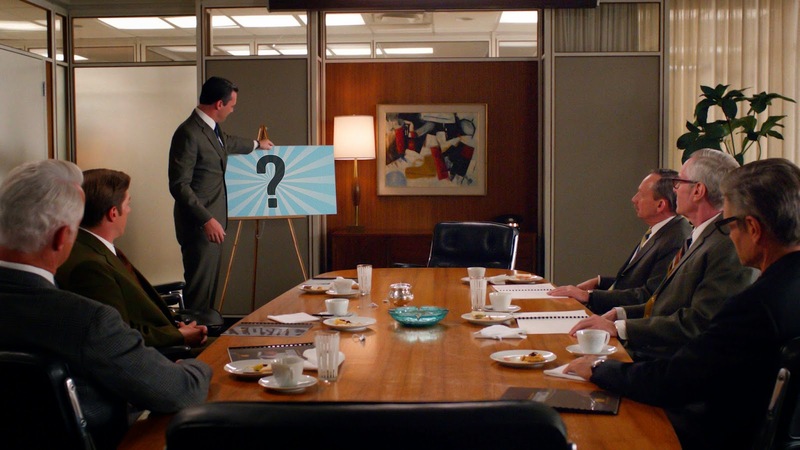 Fifty-five years later, your fund has $81 billion. All this means is that your fund grew at about 7.5% per year, which is about the growth target set by the UC Retirement Program and similar funds. Prof. Campos was, in other words, amazing Times readers with the miracle of compound interest. As for other benchmarks, Warren Buffet actually returned 19.7 percent per year in a similar period. 10 percent annual returns on investment is a standard target; the S&P 500 has long returned about that when dividends are reinvested; venture capitalists look for five-year ROIs that are orders of magnitude more than 10%. So even before we start correcting Prof. Campos growth curve, we can see that 10x over 55 years (inflation adjusted) is what is supposed to happen to resources in a successful economy. Second, the article's use of aggregate funding growth drove budget watchers crazy. At Inside Higher Ed, Dean Dad sounded off, calling the column "both a failure and a mess, and the two are related." His piece expressed common academic anger at the sloppiness with which the mainstream media tosses around bogus charges that don't need to be true to do enormous damage. Brian Leiter, in the law school world, hated on Prof. Campos' long division. On Monday, more or less the best non-IHE/CHE journalist working on higher ed funding, Jordan Weissmann, went after the piece in Slate under the title, "The New York Times Offers One of the Worst Explanations You'll Read of Why College is So Expensive." He delivered the right College Funding 101 lesson, which is that it isn't total dollars but dollars per student that matters as a baseline: "Depending on who's counting, states are giving schools somewhere between 25 and 30 percent fewer dollars per student than they were 15 years ago. And someone has had to make up that difference. Namely, college kids." Precise curves will vary, and the exact peak of state support may have occurred in 1987, 1990, or 2001 depending on which inflation index you use. But the correlation is clear: per student funding has declined, and student tuition has gone up. Back at Lawyers, Guns & Money, Prof. Campos produced a more conventional chart with the consensus conclusion. Appropriation growth is terminated by student enrollment growth. Appropriations go sideways after 1990 and then decline after 2010. 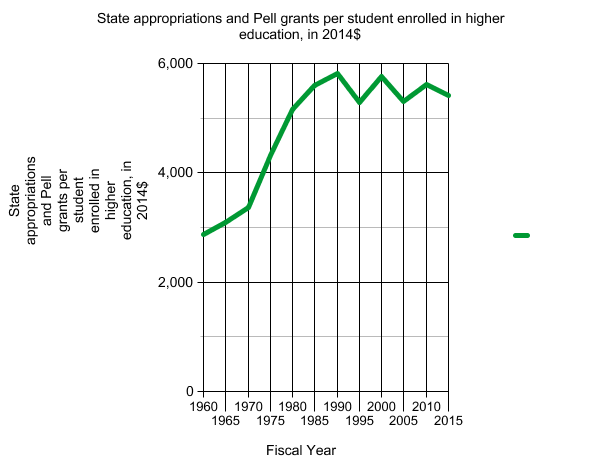 Take Pell Grants out, and you get the standard decline story. (You should take the Pell Grants out: they are federal money that backfills tuition charges to students, not new operating allocations.) SHEEO's latest report has the definitive version. This is net tuition (green) and state appropriations (blue), per student FTE, in 2014 dollars using SHEEO's Higher Education Cost Adjustment (HECA) index. Note, to repeat, that real per-student state appropriations are down about 25 percent from 25 years ago. Note that a doubling of net tuition has not brought total resources back to their 2001 peak. Recall that this is the period in which US degree attainment fell to 16th place in OECD rankings. Note that rising college enrollments has now reversed. In other words, per-student public funding has been cut. Tuition and student debt have boomed concurrently. So Prof. Campos winds up back where we all started, with per-student appropriations that are less that what they were seven years ago or 25 years ago, and with educational problems that follow from the reality of this long-term austerity on the public side of the university system. So why did Prof. Campos deny per-student austerity, which is real, to focus on aggregates that stopped rising very quickly about twenty-five years ago? My theory is that he has been driven half-mad, like many of us, by the refusal of senior academic managers to put their own choices into the picture, and say yes we too have increased costs with our decisions. Prof. Campos seems to have been willing to reinforce damaging stereotypes of overfed public colleges in his obsession with rejecting the causal claim that public cuts (and only public cuts) produce tuition hikes. His last line in the Times reads: "What cannot be defended . . . is the claim that tuition has risen because public funding for higher education has been cut" (emphasis added). In other words, he's saying, universities have hiked tuition also because of other cost increases, many chosen by the universities themselves. And on this point, he is absolutely right. His Times piece moves on to offer its own causal explanation. [A] major factor driving increasing costs is the constant expansion of university administration. According to the Department of Education data, administrative positions at colleges and universities grew by 60 percent between 1993 and 2009, which Bloomberg reported was 10 times the rate of growth of tenured faculty positions. Gee also increased the size of the university’s senior staff by 30% and raised their average salaries by 63%, to $539,390 in 2011. To get a sense of how out of control university-administrator compensation has become, consider that a year before Gee began his first tenure as Ohio State’s president, the president of Harvard was paid $138,044 ($256,000 in 2012 dollars), and only eight university presidents in the entire nation made more than $200,000. Now, thanks to Gee and his ilk, there are dozens of administrators at Ohio State University alone who would consider that sum an insult. If you think this is cherry-picking, look at another figure showing the unmistakable national pattern. 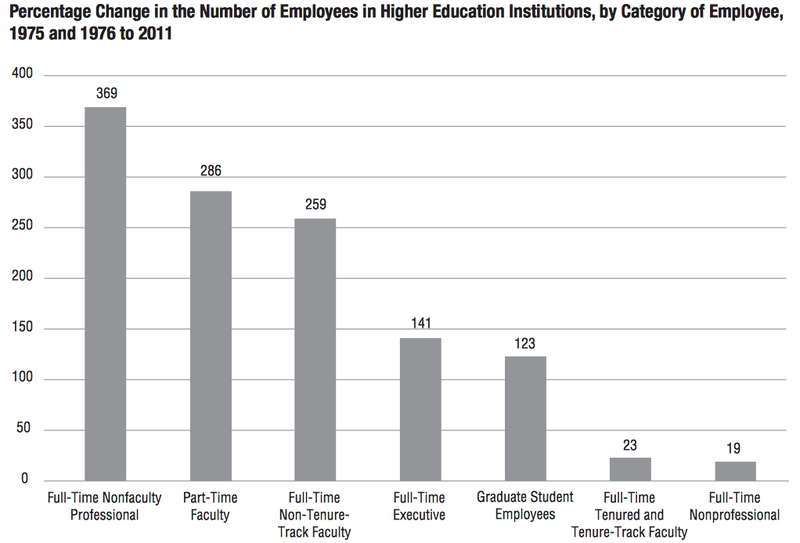 The largest employment growth is in non-faculty professions, which include not only senior staff but the ever-larger administrative middle of public universities. This lopsided growth marks a major shift in resources from educational to non-educational personnel. It has coincided with two other things Prof Campos and many others lament: faculty salaries that on average have stagnated since 1970, and the adjuncting of most college instructional staff. "Administrative bloat" means falling faculty salaries (see Prof. Kich's numbers) and downgrading education. Administration competes with instruction and research for the limited internal funds that underwrite both, and has been winning. Mr. Campos blames administrative bloat and high salaries; I disagree. The State of California, for example, funds the University of California system at the same level as it did in 1999 — even though today we enroll 83,000 more students and have one more campus. What? This is like saying, "I didn't pay too much for my new car since I made less money this year than last!" Obviously a university can get less money from one major revenue source and still spend too much of it on administration. Perhaps an editor butchered Mr. Brostrom's argument: this certainly doesn't qualify as a serious response to questions about internal costs that university administrators have themselves tolerated or initiated, or to the educational damage and workplace degradation that result. So nothing will happen, until the next faculty cri de coeur that houses a reasonable point in an overblown war machine aimed at maddening discursive defenses. Mr. Brostrom and Prof. Campos are two sides of the same coin, or the two poles of a frozen dialectic. One side says the problem is all outside the university, particularly in legislative cuts. The other side says that the problem is all inside, particularly self-serving managers larding up administration. Each side uses the other to disengage from open institutional politics that would involve all parties. The debate has occupied the center ring for years. It prevents discussion of the deeper forces reshaping the university. A summary term for those deeper forces is privatization. Neither the Brostrom or the Campos side focuses on the fact that privatization increases expenses as well as revenues. In reality, privatization forces the mission creep of multiplying activities, "businesses," funding streams, capital projects and other debt-funded investments, which increase all sorts of non-educational costs and also administration. Private partnerships, sponsors, vendor relations, and so on bring in new money but also cost money, require institutional subsidies, and in many cases lose money for the university. University budget offices have a bad habit of reporting revenues in many areas without subtracting costs. If they really want public understanding of college costs--which I doubt--they need to disaggregate internally-driven cost increases. Not all increased costs express a "cost disease." Some reflect improved quality of educational services. Universities should try to separate increased expenses that improve "quality of care" from those that are focused on increasing revenues. Then the latter should be broken down into those that produce net increases and those that don't. I am aware that this would be hard and somewhat subjective. But trying to do it would hugely improve the cost debate, and also public awareness of why per-student public university expenditures never go down. Administrative bloat is one of the prices of privatization. Until we can have honest accounting of privatization's costs, public university funding will be going nowhere. And academia's leaders will obviously be far more responsible for this stagnation than any number of articles by frustrated faculty like Prof. Campos. I’ve written before about my experiences at Portland State for Remaking the University. I’ve described effortsmy colleagues and I made to increase tenure-line positions. I’ve explored whythese kinds of efforts are difficult to coordinate and sustain in environments already reliant on non-tenure-track (NTT) instruction. Some of the readers have agreed with me that those of us with tenure should use it to refuse to grow through precarity. They then have taken the next necessary step—a hard look at the numbers. (See, in particular, Matthew H. Clark’s excellent comment on the math at the bottom of thispost.) They ask, as we all must: How realistic is it to push for a return to a majority tenure-line workforce at the typical public university? At Portland State, as at many other state universities across the nation, we have what is now being breezily referred to as “the faculty mix”: tenure-track (TT), full-time non-tenure track (NTT), and part-time or adjunct faculty. Full-time NTT faculty members are involved in governance and service; adjuncts are not. The involvement of the former is an acknowledgment of a reality that has obtained for at least two decades: though on one-to-three-year contracts, these faculty members are permanent. Now, as we’ve steadily grown our third workforce, the adjunct faculty, it too is arguably as permanent. I’ve discussed before thenumbers behind Portland State’s economic dependence on faculty originally often hired as if they were stop-gap. I don’t have access to all the university numbers so I can’t say how much money would be liberated for faculty hiring were administrator salaries and real estate purchases to eat up less of the budget. I do think, however, that it is fair to say that we cannot afford one tenure track composed of positions bundling research, teaching, and service. I think it is equally fair to say that we can afford two tracks. In our forthcoming book, The Humanities, Higher Education and Academic Freedom: Three Necessary Arguments, Michael Bérubé and I call on universities like Portland State to create a tenure track for full-time faculty hired and promoted on the basis of excellence in teaching, and require that the vast majority of faculty be hired onto this track if not hired onto the other research/teaching tenure track. As a boundary, part-time adjunct instruction should account then for no more than 10% of student credit hours a term. The ratio of teaching-intensive faculty to research-and-teaching faculty will depend on many variables, and no doubt the relative size of the two tracks will vary greatly from university to university. The important thing in our minds is that both tracks confer eligibility for tenure after rigorous review. Universities will improve the teaching their students receive—there will be more accountability, not less, in such a system–and they will strengthen faculty involvement in service and governance. It is this last area of faculty work—service and governance—that has most convinced us of the necessity of tenure eligibility for all full-time faculty at universities. Time and again, I’ve seen governance dynamics sour when committees operate on the implicit pretense that TT and NTT faculty have the same degree of security with which to deliberate on issues. Awkward, failed committee work is often attributed after the fact to TT faculty’s arrogance and insensitivity to NTT faculty vulnerability. This no doubt is a factor in some places and at some times, but in my experience, the situation is untenable because everyone in the room becomes painfully aware of the power differentials warping the discussion’s outcome. In these environments, nobody feels free to say what she or he thinks—the TT faculty for fear of looking like a bully, the NTT faculty for fear of repercussions for their future. At Portland State University, I currently serve on a “Faculty Roles and Structure” topic team, a kind of subcommittee of a university-wide strategic planning committee. Last week, two of us from the topic team—myself (a long-time TT faculty member) and a colleague from another department (a long-time NTT faculty member)—had a meeting with a staff member from the President’s office to discuss scheduling and other logistics. We found ourselves telling her that there was something extraordinarily naïve about putting a bunch of strangers of different ranks into one room and expecting us to walk out with a coherent set of recommendations concerning the faculty mix. My colleague told the staff person she should consider the university a country club circa 1950: the TT faculty members are the elite and NTT faculty, the excluded. And TT faculty concerns are real, too. The sometimes casual hiring of NTT faculty, some of whom do not have terminal degrees, has led to a situation in which some TT faculty are uneasy throwing governance open to all faculty. They worry that people who have not gone through the entire training process of the discipline—which includes not only the earning of the terminal degree in their fields (typically, the Phd or MFA) but the work involved in competitive searches —may not be well-equipped to promote and preserve disciplinary standards. Additionally, TT faculty are not slighting their NTT colleagues when they worry that growing groups of faculty involved in governance without job security weakens the faculty’s aggregate ability to enter into shared governance with administrators as equals. Tenure not only provides a degree of independence that multi-year contracts don’t; the hiring and evaluation processes are legitimating in and of themselves. One feels a lot less vulnerable when many different people and stages were involved in one’s hiring and retention than when one or two people were. Another commenter on the IHE thread following Michael’s article wrote, “At my school, there are numerous adjuncts with MAs who simply got their job because they live in the area and know the right people - a patronage system. However great their teaching evals , this practice is deprofessionalizing our profession.” The last thirty years of off-track hiring, Adriana Kezar and Daniel Maxey argue in “Adapting by Design,” now threatens the “core of our educational mission and the status of the academic profession.” This cannot be construed as an insult to NTT faculty when it is very patently the resulting institutional dysfunction, not the unprofessionalism of individuals, that has pushed us off our ivy-covered brick walls. Many administrators will argue that they turned to faculty with higher courseloads to survive when states divested from higher education. Okay, we can answer, but you can and must find the money for a full-time teaching-intensive tenure track composed of positions with comparable salaries and equal benefits. With a teaching-intensive tenure track, we establish a credible degree of equality and legitimation and protect academic freedom. And we treat the profession of college teaching with the dignity it deserves.